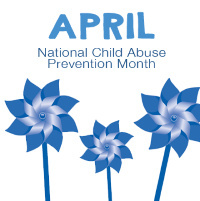 April is Child Abuse Prevention Month in the United States. Dove's Nest encourages faith communities to take time during April to consider the plight of abused children and find practical methods to end child abuse and neglect in the communities where they live, work, and worship. This year's focus is Parenting for Prevention, as we all know a parent is a child’s first teacher! We hope to equip and encourage parents and caregivers to introduce Circle of Grace concepts and affirm them at home, whether or not the child is being taught Circle of Grace. God has a vision for healthy relationships where all are respected, loved, and cared for. From early childhood to adulthood, our children are learning about their bodies and how to treat the bodies around them. As a faith community, we should be part of that journey. A 2019 Bulletin Insert by David Orr [doc] [pdf] that includes a prayer for children and a short reflection on the importance of healthy boundaries and consent from children's earliest years. A three-page 2019 Parenting for Prevention study guide by Samuel Voth Schrag, Dove's Nest board member. Dove's Nest's mission is to empower and equip faith communities to keep children and youth safe in their homes, churches, and communities. "Let the children come to me. Don't stop them! For the Kingdom of God belongs to those who are like these children" (Luke 18:16 NLT). Everence now offers $350 Safe Church Grants! Find out more about having Dove's Nest visit your faith community. Let the Children Come: Preparing Faith Communities to End Child Abuse and Neglect. Herald Press. This book helps Chris­tians learn about their role in ending child abuse and neglect in all commu­nities. A child and youth protection policy in a faith community helps to ensure safety for children and youth. A written policy needs to be adopted as well as implemented and made accessible.